In our Wireless Traveler Giving Back Series we are delighted to feature some of the activities of our clients who go above and beyond in giving back to the community – both locally and globally! George Hicker, a Syracuse University alumnus, has experience ranging from the business world to music and real estate. He and his wife Kathy epitomize generosity of time and spirit. Médora: Can you describe the Syracuse program that helps those with disabilities? George: The program I’m involved with at Syracuse is with an individual named Brian McLane. I met him during my freshman year at Syracuse and he’s been a quadriplegic since birth. We’re involved with four projects right now under the McLane Legacy Fund. Our first project upgraded about twenty-five buildings in respect to directories, water fountains, and ingress and egress. A second project is two carts that will help disabled students get to their classes and around campus more easily. A third one is an upgrade, for the mentally and physically disabled, to gain access to the Internet via computer systems. And the fourth project is a program that really hasn’t taken off yet, but the intention is to implement more individual and one-on-one contact to help students navigate their education at Syracuse. Médora: What inspired you to begin the program? George: It was the observation of the mentally and physically disabled in general, and how people are many times unconscious to what they have to deal with; and I probably have extra insight and knowledge having known Brian for over fifty years. Médora: So Brian is still fully immersed with this program as much as you are? George: Yes, he even lives at the Sheraton hotel on campus. Médora: Does the university itself contribute to the funding? And are you actively seeking other donors? George: Yes, the university contributed $1 million to the first project that I mentioned. As for donors, my initial donation was $1 million and there are people that I’ve known over time, such as John Chapple, a former Chairman of Board trustee who committed $250,000, as well as three people who have contributed $50,000, along with other donations continuing to come in. We’ll see where all of this goes beginning in the upcoming semester. Médora: Does this program give volunteer opportunities to students without disabilities? George: Not to my knowledge at this point, no. One of the things we did was assist with the Summer Start Program for kids with disabilities at Syracuse. Last year we funded nine or ten scholarships, and all but one of them are still in school. Médora: Does this program continue to help these students even after graduating? George: Well as of now the program is only two years out, so none of the students in the program have graduated yet. However, I doubt it, I believe the program will mainly be helpful during their time at Syracuse. Médora: In addition to this wonderful work at Syracuse, you are currently in Kenya. What is the purpose of this trip? George: Well there are a number of things. My wife and I have been coming to Kenya since 1972 and we have built a house adjacent to the Mt. Kenya Safari. So this is the second time we’ve been here for an extended period of time since the house was built. And there’s an educational program to save an endangered species called the Bongo that we’re involved with. I think it’s just the most God sent group of people I’ve ever been around; they have so little and they’re always smiling. And in addition to that, which you don’t have in other places that you go to is that when you go out into the bush, you see every imaginable thing that can happen, amongst cheetahs, lions, rhinos, leopards, every kind of antelope; it’s just a phenomenal place. Médora: Are you involved in any other philanthropic activities? George: I have a scholarship fund running at the high school I went to. In fact one of the three people who got the scholarship is going to go to Syracuse. I’m also the Chairman of the Board for the Fellowship of Christian Athletes in Los Angeles. We deal with over 5,000 kids a week, 20,000 a month, in almost 100 schools. Our mission is basically predicated on the understanding of the bible and helping kids stay out of trouble. Also, KidSave International which is headquartered in Washington and Los Angeles; which is also how we adopted our own boys from a Russian orphanage ten years ago. They’re both now juniors in college, in fact one’s at Syracuse. KidSave has brought thousands of kids from Colombia, Russia, Kazakhstan, and China to the United States for adoption. Médora: As an alumnus of Syracuse University, what’s one piece of advice you would give to the recent graduates of 2016? George: You’re going to go out, you’re going to think that you’re going to know what you’re going to do. And the majority will find out that it’s not what you’re going to do; that you’ll probably end up doing something entirely different than what your education prepared you for. 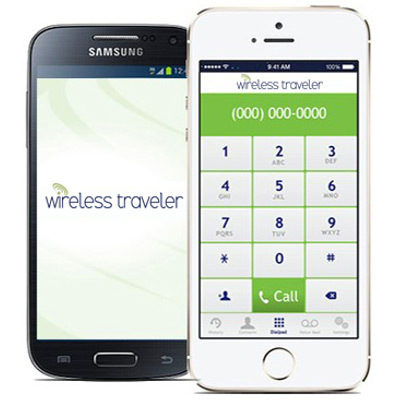 Médora: Lastly, on behalf of Wireless Traveler, how is the Wireless Traveler Wi-Fi Calling App working for you in Kenya? George: *Laughter* The last time we came here a year ago, we were on a ship for seven days, and I kept turning on the Cardinal games in the middle of the night to watch their baseball games. I think the bill was $2,300! And if I used my other line, I don’t know what the bill would have been. But for calls, the reception is good except in the Mara, understandably; but yeah, it’s been great. I don’t think I’ve spent $20 yet and I’ve been on the phone a lot, close to 22 hours of business calls from Kenya!